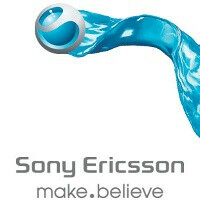 Just a day after Google reported about there being 190 million Android phones manufacture, Sony Ericsson has announced its quarterly financials and 22 million, or around 11.5% of those, were handsets mady be the Swedish-Japanese JV. "We will continue to invest in the smartphone market, shifting the entire portfolio to smartphones during 2012," SE's CEO Bert Nordberg confirmed. Sales in the quarter amounted to 9.5 million units, a recovery from the 7.6 million sold in the summer quarter, but still down 9% when compared to Q3 of last year. Results for the third quarter also slightly beat analysts' expectations as the company swang back into operating profit, after a disappointing second quarter. Looking at net results, the SE broke even. 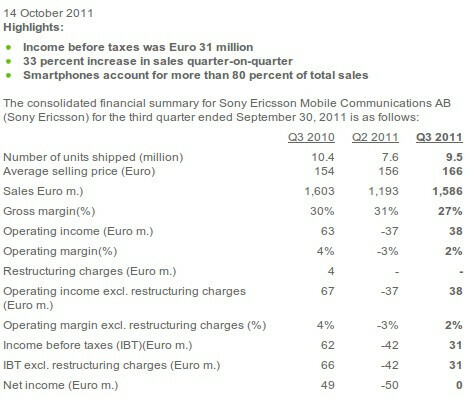 The average price of a Sony Ericsson handset surged to $223 (166 euro). The company didn’t comment on the latest rumor claiming that Sony is about to buy Ericsson’s 50% stake in the phone maker. Analysts have pointed out that the move would be welcome for SE’s smartphones as they’d be able to fully integrate Sony’s services. Ericsson’s stake is estimated at around $1.5 billion. patience my friend. 2011 is only SE's appetizer. You'll see their main dishes by 2012. That's 7.6 million xperias sold in the quarter. And more than 50 percent growth in android sales, given that they were still selling symbian during the previous quarter. Decent numbers,(and better than those of LG and Motorola I bet) but I feel they still missed a major chance by failing to get the Xperia arc to U.S. carriers, instead of Play. Alot of main dishes coming 2012 including dual core Wp with top class camera, xbox integration, slate integration, and more! Looks like timely sofware updates helped them this time around. . .
Well worth the wait, despite having been so eager for it. well zero is still better than negative numbers. hope they will have better years ahead. the arc was great looking phone so was the ray but the arc lacks front facing camera and too pricey while ray have small screen. se were able to improve the looks department but still lacking in the features department. hope they address those department.